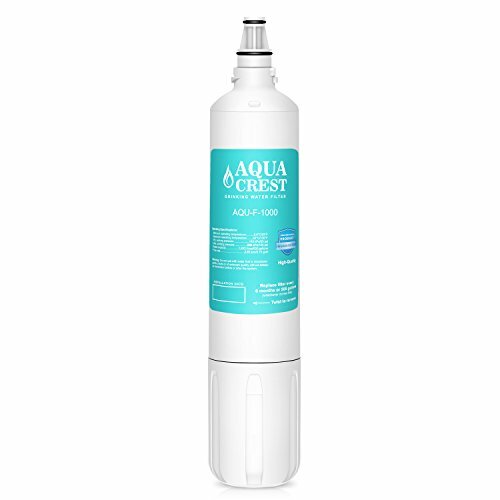 The AQU-F-1000 Replacement Filter Cartridge keeps your water tasting clean by reducing particulates, chlorine taste and odor. The design allows for quick-and-easy filter swaps. It automatically shuts the water off when the filter cartridge is replaced. We recommended that the filter be replaced within 6 months.  Compatible with InSinkErator F-1000 & F1000, Sub-Zero 4204490, 4290510, PRO 48, PRO 48 with Glass Door, BI-36F All Freezer, I-36U Over-and-Under Refrigerator/Freezer, BI-48S Side-by-Side Refrigerator/Freezer, BI-48SD Side-by-Side Refrigerator/Freezer, BI-36UG Glass Door Refrigerator/Freezer, BI-30U Over-and-Under Fridge/Freezer, BI-30UG Glass Door Fridge/Freezer,BI-42S Side-by-Side Fridge/Freezer, BI-42SD Side-by-Side Fridge/Freezer. This filter is not sourced by or sponsored by Insinkerator.